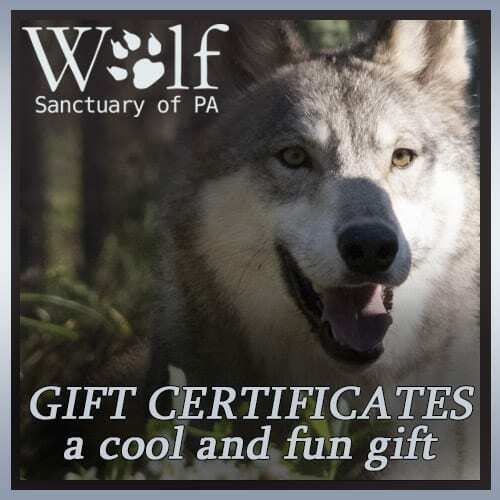 Our family appreciates your support for Wolf Sanctuary of PA.
PURCHASE ONLINE – It’s SAFE and SUPER EASY. *Please note: AOL email does not always accept attachments from websites. If you have an AOL email address, please call us at 717-626-4617 to place your order over the phone. Gift certificates can be redeemed in our gift shop or for some online items. If you would like to use a gift certificate to place a tour reservation, please call us to place your reservation over the phone as certificates cannot be redeemed through our online tour booking system.